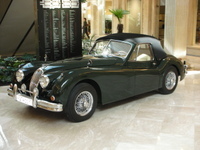 The Jaguar XK140 I photographed back in September is still at our local shopping mall. Now it has been joined by this splendid 60's Corvette Stingray. Unfortunately I didn't have a proper camera with me, but I hope this effort from my phone is at least web-worthy. My wife was impressed that I knew what it was. Actually, it was easy. One of my boyhood "Hot Wheels" models was a Corvette. Of course it's not as classy as the Jag and I am sure Jeremy Clarkson would say it "doesn't do corners." Still it looks like too much fun to sit idly at a mall. Shopping centre operators in Russia seem to have a better idea how to keep men interested in visiting, eh? Winter began today in Moscow. 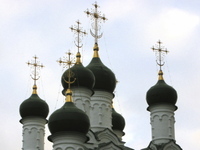 I went out with just a sweater for warmth and was given many disbelieving stares by well-wrapped-up Muscovites. By the time I had walked a mile or so, I realised they were right. This is a picture of the nearest church to my home, silhouetted against a cold sky at 1730 today. 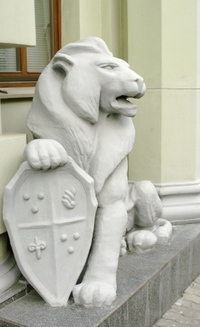 One of two lions guarding the entrance to an apartment block in Central Moscow. Only in Moscow could you find a swimming pool (for demonstrating swimwear), a classic Jaguar, an antique shop selling a World War II machine gun and more staff than shoppers in a shopping centre on a Sunday afternoon.